Blizzard sure is busy this morning, and has unveiled a heap of new game features for all of its major titles that are sure to excite us all! 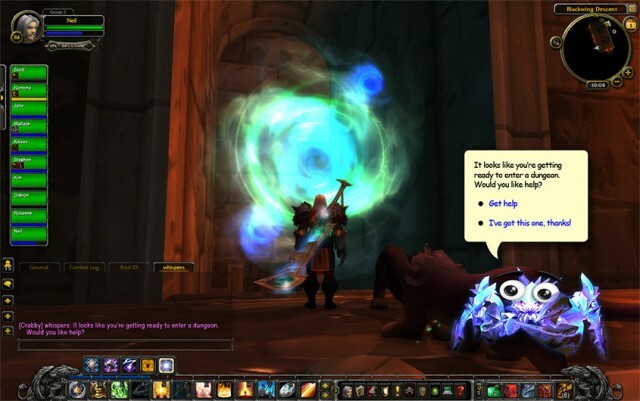 The Introduction of Crabby the Dungeon Helper in WoW: First we had the dungeon finder, and now we have Crabby at your side, ready to provide tips and hints to help you when you’re stuck. He provides encouragement, even after the umpteenth wipe of the night. Just remember — nothing escapes Crabby’s unwavering gaze. And for now, he cannot be disabled. He’s your friend, whether you want him to be or not. A Horadric Cube transmutation app that allows smartphone users to combine any apps on their devices to create new versions with smart features. Just imagine – you could combine your WoW armory app with Facebook and call it Real ID. An old controversy reborn anew! Blizzard also promises that a translocation feature is on the horizon. We can’t wait to see what else Blizzard — and other game developers — have in store for us today. April 1 is a great day to be a gamer! Less than 5 minutes with his little pop-ups on the forums, and I fled the WoW forums before I attempted to leap through the computer screen at him. Way better at advice than the paperclip.